It’s only January and already people are having relationship, housing, family and career breakups. This is no surprise, as we just finished a Mercury Retrograde (3-24 December, shadow passed 10 Jan). Mercury Retrograde is a time to release energy thieves and clutter. I call it a quarterly life review. Watch me discuss this post on facebook! 2+0+1+8 = 11/2, the Master Number for spiritual growth and equal partnerships. 11 looks like an equals sign or a bridge between worlds. It can bring oneness or division (a split personality), depending on how you wield it. It’s like a light sabre from Star Wars. You can use it to conquer darkness, or to poke yourself in the foot! Ideally, 11 acts as a river of change (CHANGE adds to 29/11) returning us to a state of flow, also called the middle way, the Tao, the Source, the Vortex, etc. Positive 11’s can see both sides and channels Star Energy to light up the World- see my post on Composite Whorl or Yin Yang fingerprints. 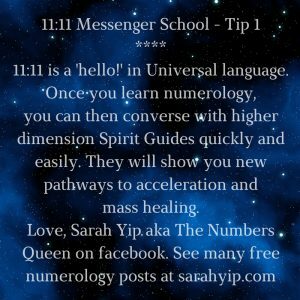 2018 is an exciting time for Lightworkers, Inventors and Futurists*, especially those with Master Numbers, 11 numerology anywhere in their charts (lifepath, name, pinnacles, businesses, spouses, kids), and many 1’s in their dates of birth. *Alternative sources of income will skyrocket, e.g. cryptocurrency (blog is in the works). It took me 17 stressful years of dating before I met Kris, my 11:11 Soulmate. 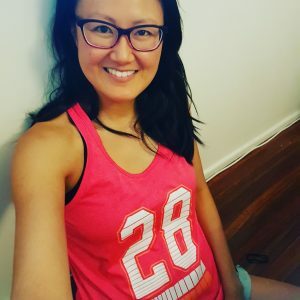 That’s me wearing his lucky lifepath number (28) in the cover photo. Even then, it was 3.5 years before we were ready for an amazing eco marriage in his hometown of Brisbane. Let’s just say, my Asian parents were super happy when I tied the knot at 35. They used to say I’d be over the hill by 25(!) So I have a lot of experience with breakups, or shall we call them breakthroughs? What I’ve learned, is that every relationship is an invitation to regain our trust in life and our ability to make a difference (see below). What you want in a partner, is what you have hidden in yourself. That’s why I love romance wishlists, because they show me what I need to work on too. Here are some thoughts for you today. “Heal your dents, heal your future. A whole heart gives you total choice.” My thoughts. BREAK UP adds to 2+9+5+1+2+3+7 = 29/11, the same vibration as WISDOM, LIGHT and DUALITY. Maybe that’s why Spike Milligan said ‘blessed are the cracked, for they let the light in’? As 2018 heightens 11 energy (and will ‘out’ many 11:11 Spiritual Messengers), it’s about breaking up with old patterns that block the flow in your life. The last chance we had to do this worldwide was in 2009. Incidentally, that’s when I studied Holistic counselling, was embarking on a challenging new relationship (which would lead to a breakup on 11.11.11), and discovered I come from a line of psychic women, who were harshly ‘treated’ for mental illness, suicidal tendencies and depression (which some people call the birth of a healer). WAKE UP adds to 5+1+2+5+3+7 =23/5, the vibration of LIFE and LEARN, while WAKE UP CALL adds to 33/6, the vibration of TEACHER and BLESSING. You could say that in 2018, if we can turn our inner and outer conflicts into understanding, we will accelerate our capacity for leadership. After all, a leader is simply someone who gets things done by resolving conflicts. The more problems you solve, the more gratitude people will pay you, financially and emotionally. 1) A breakup reminds us that life is a quest for understanding. As they say, you’re either evolving or going extinct. Assuming you’re human, you’re 60-70% water. Water is a polar molecule*, that’s held together by power struggles, and always looking for new combinations. It’s constantly making and breaking bonds. Perhaps that’s why we, as walking ‘water bodies’, seek relationships (be they people, jobs, houses, even gurus) to keep us on the move and growing? *The Oxygen atom in water, has a slightly negative charge because it attracts electrons from the two Hydrogen atoms, which gives them a slightly positive charge. This inner conflict creates a ‘polarity’ or magnetism, which enables water to dissolve other molecules like salt. Not only do opposites attract, they empower each other to overcome difficult obstacles. Food for thought. 2) A breakup teaches us to spend our energy wisely. When you experience a breakup, you’ve found a formula that doesn’t work. You’ve exceeded your energy budget. Created a relationship that costs more love than it brings. Hired a car that uses more fuel than you want to buy. Ordered a dish that doesn’t fill you. In the end, it doesn’t matter if someone ticks all the boxes, if they leave your heart’s song unsung, then you are living a lie*. Good on you (and me) for trying. That’s the only way you get better at relationships, by being in one, or studying those who have what you seek. Sure, Yoda may have said ‘do or do not, there is no try’…but then again, Yoda was single! (There was a character called Yaddle but she wasn’t his spouse, just the same species). 3) Finally, a breakup can catapault us to higher consciousness. As Rumi said, ‘the wound is where the light enters you.’ It accelerates the death of ego, which is how you become fearless. You can dig many wells and never find water, or one deep well and you will always find water/ Source. Why not substitute ‘well’ for relationship and ‘water’ for love? A well is something we construct, to access a resource. A pipeline to the depths. A way to faster (emotional and intuitive) flow. Every relationship you create and uncreate is a pathway in your brain, an idea that you summoned into form through repeated visiting. Change your route, get home sooner. Master the art of digging (asking questions and not quitting until you find a satisfying answer) and you’ll never go thirsty again. See books like The Master of Love, by Don Miguel Ruiz. BONUS Section – Are Sceptics (Head-trusters) Just Disconnected Psychics (Heart-trusters)? On the topic of brains… I am reading the most incredible book by Ashley Montagu called Touching, about the power of human contact. It suggests that sceptics (people who are slow to trust) are often children who didn’t get their needs when young. The reason they only believe in facts and figures (and convert well to numerologists!) is because they were not ‘seen’ or ‘believed’ until they acted up. An infant whose cries were ignored or whose parents were emotionally or physically absent, may decide that they are not lovable. They stop believing in a benevolent Universe. They throw the baby (Soul connection) out with the bathwater (pain). ‘I have to be negative to get attention’ and ‘I have to fight for everything’. For those of you who think I’m bananas – I know I’m not. I talked to my two sons before they were conceived, during pregnancy and as soon as they were born. Telepathically. As a trained scientist, with a background in Government and UN work, I can assure you I’m hard to impress. My Guides have had to bring out the fireworks to convince me they exist! Nowadays, I work with parents, Spirit babies and kids every week with excellent results. In my experience, it’s more masculine/ Yang/ Western culture to be a ‘one hit wonder’ and think that time can be saved or wasted, while it’s feminine/ Yin/ Eastern culture to ‘go around in circles’, believing in second chances, the spiral of life and reincarnation. Even our reproduction reflects this pattern. Maybe that’s why one of the kindest remedies for heartbreak is to get in touch with your creativity and ‘mother’ yourself back to balance. To go inside until the weather calms down. We need a balance of masculine and feminine energy in a relationship to keep it strong and moving (like liquid water molecules). This doesn’t mean that love can only exist between a man and a woman (I’m pro-gay marriage – who’s to say we won’t be gay or lesbian next life), but in productive partnerships, you generally find that one partner wears the hat (or pants), more than the other. You don’t always need to break up with someone to get the wake up. Depending on circumstances, you can ‘break up’ many times within a relationship, and keep going to higher levels. Growth is natural when you feel supported, we’re like beanstalks in that way. My husband Kris is a 28/10/1 lifepath Pioneer and I am a 29/11 lifepath Spiritual Messenger. As lifepath ‘neighbours'(a 1 and 2), we’re chalk and cheese. Although we rarely agree on anything (e.g. he likes guitar metal, while I like chanting), our Spiritual and past life connection is so strong, that we keep returning to each other in our Earthly incarnations. We both have the ‘Black Sheep’ line in numerology i.e. no 4-5-6 in our dates of birth – as I wrote here, this reveals someone who is ‘all or nothing’ and must learn to persevere. I’ve learned that the grass is always greener, but not always more nutritious, on the other side. Better to choose wisely, and stay the distance with someone who can keep you laughing out loud. Now, when things get heated and I feel unloved, I don’t panic. Instead, I refer to my ‘safety net list’, call a friend or healer buddy, and/ or I go and paint until I’m centred again. Making art helps me to ‘break up’ with my old thinking, enabling me to stay in relationship with Kris instead of projecting my crap on him. I hope this article will bring you peace and creativity. Wishing you a very happy relationship year in 2018. Make your break ups wake ups and you’ll never have to repeat those subjects again. 11:11 We are here for independence! Let’s grow into our Higher Selves on Earth. 2017 Numerology Forecast – Will You Make a Fresh Start? You Can’t Not Belong – 4 Ways to Forgive Your Family (Especially Your Parents) – BTW PARENT adds to 29/11, so 2018 will also bring lots of family healing! !